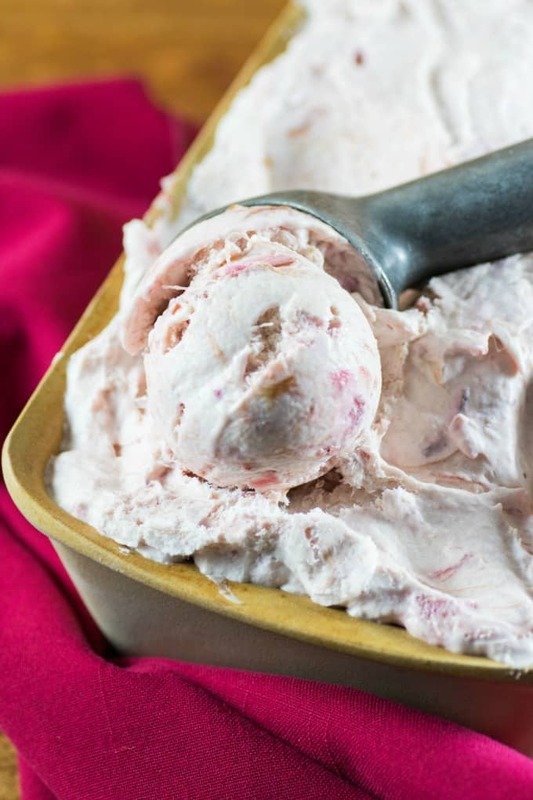 No Churn Rhubarb Ice Cream Recipe is easy to make! One of our favorites around here is rhubarb. We have a huge rhubarb patch for our little garden!! We have packed in a lot into our tiny space. It is so easy to grow and harvest and it comes back every year rain or shine! 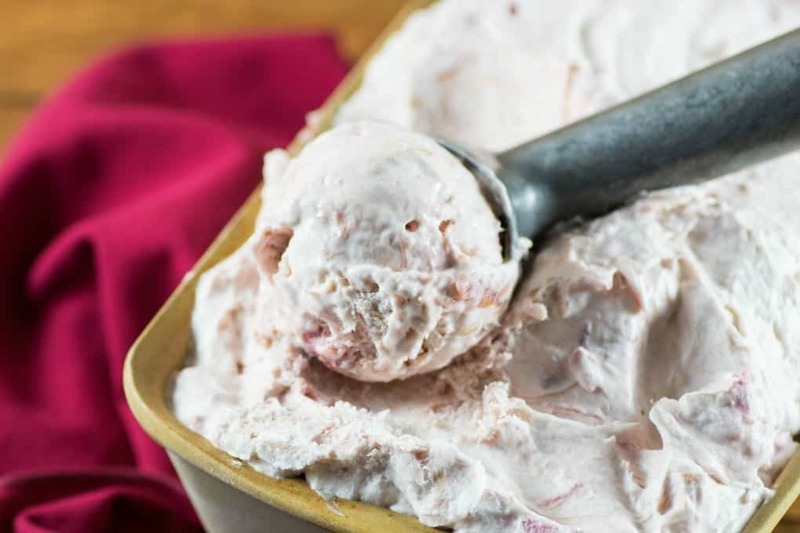 So I decided to now make for you a No Churn Rhubarb Ice Cream Recipe. We have done loads of very successful recipes on the site using rhubarb. The most poplar recipe is Rhubarb Dream Bars. Also among the favorites is Old-Fashioned Rhubarb Loaf, Super Easy Rhubarb Tarts, Rhubarb Strawberry Crisp, Rhubarb Margaritas, Rhubarb Strawberry Sour Cream Pie and one of my faves Rhubarb Strawberry Cobbler. I pack away rhubarb in our freezer by first cleaning it and chopping it up, then put it in 4 cup batches in freezer bags so we have rhubarb all year round. Nothing like a simple compote with yogurt to make you feel like spring will come in the dead of winter. 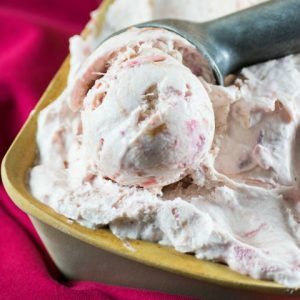 This ice cream is so rich and creamy and you would never know that is was this easy to make without churning or any special equipment!! Our daughter Amber devoured this in delicious milkshakes or just serving it up in a bowl. It has just the right sweetness too! It fit perfectly in a loaf pan sized container, which reminded me how they serve up gelato, which I have always loved!! The tart rhubarb was first made into a compote that was then easy to incorporate into the cream base. The result was a heavenly mix of deliciousness. This is a must try for any rhubarb lover!! There are many different kinds of rhubarb, so if you are planting some make sure you are getting the lovely dark red varieties. They will make all your recipes so much nicer with the rich deep color they add. 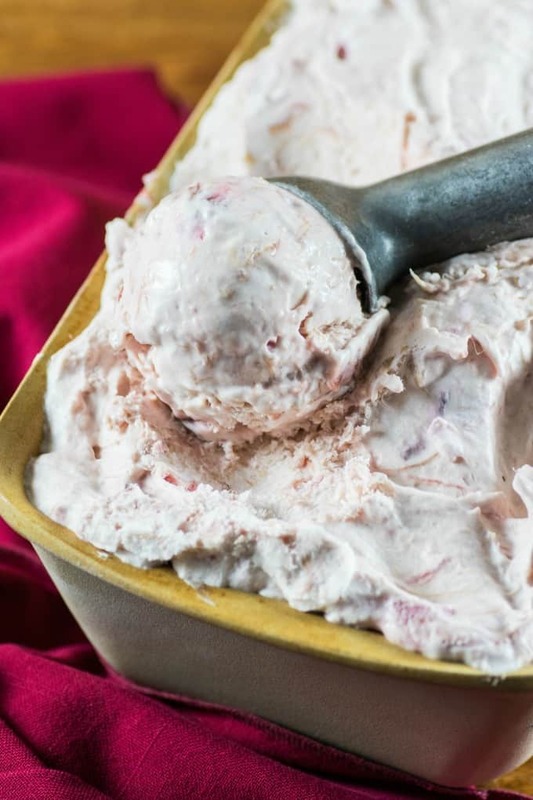 No specific equipment is needed to make this incredible No Churn Rhubarb Ice Cream Recipe. 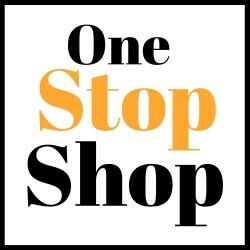 It is so easy and everyone will love it. Place a bowl and whipper for the whipped cream in the freezer to chill. In a small pot add the rhubarb and sugar. Cook for about 10 min. simmering or until rhubarb falls apart and is very soft. Set aside to cool completely. When rhubarb is cooled, in a large bowl, whisk together the condensed milk, vanilla, and salt. Add the rhubarb. Whip the cream using the cooled equipment on high speed until stiff peaks form. Fold one cup of the whipped cream in the condensed milk mixture and combine well. Fold in the rest until well combined. Place in a 9x5x3" pan, it will be very full or use more than one container. Cover lightly and freeze. That sounds really interesting. I’ve never had a rhubarb dessert that wasn’t mixed with strawberries. I’ll have to give this a try. I like rhubarb just on its own but it is very good with strawberries too!! I have honestly never tried rhubarb before, but have always wanted to give it a go. This might just be the recipe to make me go for it. Thanks for sharing. This sounds so delicious for during the summer months! I’m all about the no churn option, too! This ice cream looks so good! I have never had rhubarb before really so it would be a real treat! 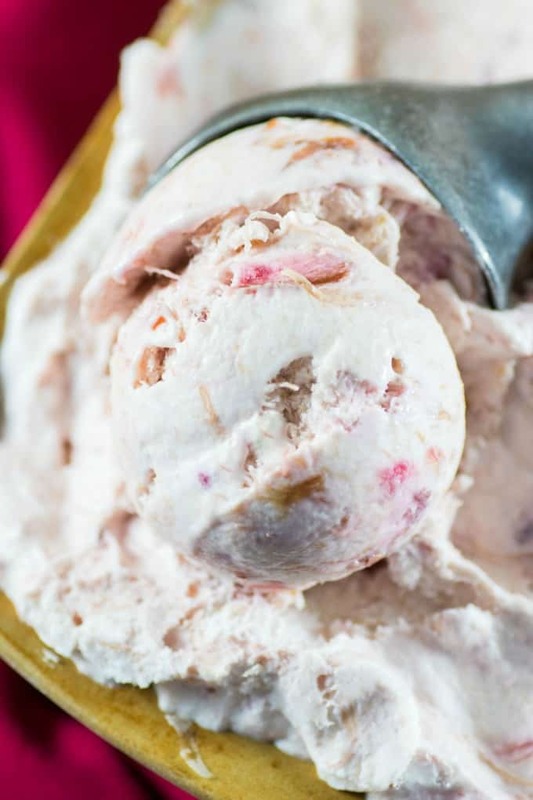 I’m an other one who hasn’t had rhubarb before…and I’ve never made my own ice cream! I’m the worst – I need to try new things! I like rhubarb but I’ve never had ice cream! I would love to try it! I have never heard of rhubarb ice cream. I know that my mother in law was looking for new ways to use her rhubarb though! Oh yummy!! This is such an amazing summer treat! I have never used rhubarb in any recipes before. I would love to give this a try! I have to try this out. I am not a huge ice cream fan but I do love homemade ice cream. I’m sharing this with my mother-in-law; she makes wonderful homemade icecream!